You read that right! 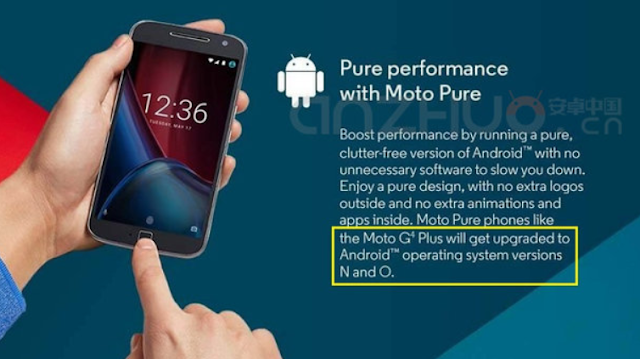 In a recent promotional image for the new Motorola Moto G4 phones Motorola states it will get updated to Android N and O! Two days ago Google introduced Android N at Google I/O with some tweaks and new features, but now Motorola just leaked the name of the next Android version: N. Will Google stop releasing system versions named after desserts? We can't know that for sure yet. What will O improve over N? It's too far away to know. One thing is clear, though, the new Moto G4 will get the next two versions of Android, and that's something really cool. When will it get N or O? That's a very good question that we are not able to answer right now, but let's hope it gets N as fast as possible.